Over the last decade, we’ve seen a resurgence in the popularity of rose gold, which is quite literally, a beautiful gold with a pink tint. But, this stunning display of opulence and color isn’t some exotic metal, it’s actually just the combination of copper and gold. The copper gives the gold that pink tint — ranging from a blush to a shimmering pink. The combination also creates one of the strongest forms of gold, much sturdier than it’s white and yellow counterparts. For this reason, rose gold is an exceptional addition to any timepiece — one that’s sure to last the test of time, and fashion. 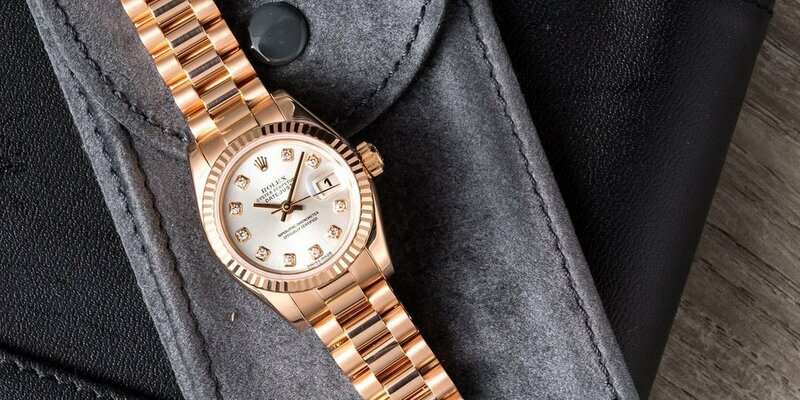 Rolex introduced rose gold, or as they like to call it, everose, decades ago. And ever since, it’s been a popular choice amongst both men and women’s watches for it’s varying tones and intensities. But here, we’re going to share some of our favorite examples of Rolex everose in the ladies’ models. Even those who don’t think their fans of pink will find themselves lusting over these beauties. This Ladies Datejust is equipped with the President bracelet. If you’re going to go for a statement piece, why not go all out? That’s half the design idea behind this everose Rolex Presidential Ladies 179175 with a Diamond Dial. The silver dial pops against that stunning rose gold color and the diamonds simply shimmer. But, we have to say, it’s the rose gold color of this encasement and band that really steal the show. The oyster case and the presidential band are both made entirely of 18k everose gold, creating a timepiece that feels luxe and unique. Besides the timeless aesthetics, this watch is outfitted with an automatic 2235 movement the classic quickset date, scratch-resistant sapphire crystal, and of course, a waterproof twin-lock screw-down crown. Let not forget to mention this Datejust also has a Mother of Pearl dial. 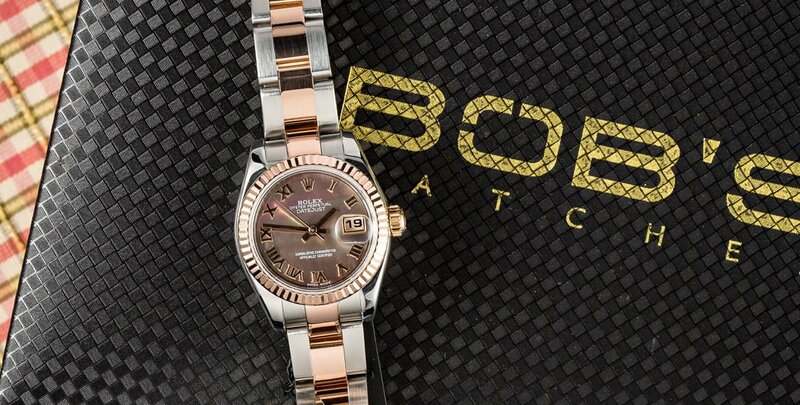 This lady’s DateJust is a timeless classic, but we can’t get enough of this modern spin combining 18k everose gold with 904L steel. The signature everose is weaved perfectly around the frame and down through the Jubilee bracelet, giving it an elegant, feminine feel amidst the sturdy medium-sized features we’ve come to love from this model. 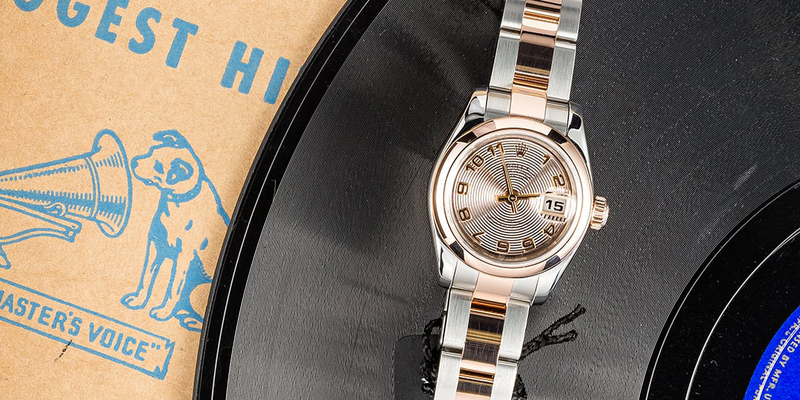 Of course, this DateJust is outfitted with a 31-jewel movement, scratch-resistant sapphire crystal, waterproof screw-down crown and the signature cyclops lens. The mix of sturdy yet stunning metals makes it a perfect watch for everyday wear, but one that will still steal glances while out on the town. This Datejust ref. 179161 has a concentric dial and a two-tone bracelet. We let another DateJust slip on the list, but only because it’s so strikingly different than our other example. We can’t get enough of the feminine simplicity of this timepiece — from the Arabic hour markers to the Oyster bracelet outfitted with stainless steel and 18k everose down the middle. That same champagne-bubbly pink flows around the case and onto the face of the dial, too. If you’re looking for a watch with understated beauty, this is undoubtedly it.